Beach Pond is also a cool attraction for kids in the summer time. With so much land available, there have been several new construction projects and West Greenwich is an attractive market for homeowners looking for rural privacy in a superstar home can check out Deer Run at Big River with homes between 3100-3800 square feet listed and selling between 639,000 and 1 million. Abutting a beautiful private pond and nature preserve on the East Greenwich border for access to shopping and amenities. With 60 home sales in 2015, it was actually an active year for home sales considering the small population size. 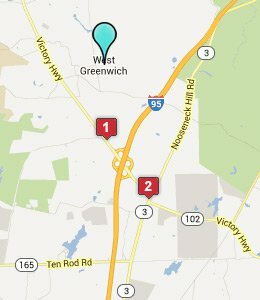 West Greenwich is bisected by the Victory highway, east of the Victory Highway property values spike upward and so Westward, there are spacious homes on large acreage parcels to be had for a lower cost per square foot in areas like Plain Road, Plain Meetinghouse, and Stubble Brook. Also just north of Division Road the neighborhoods surrounding Lake Mishnock offer a great price point for home buyers in the RI median zone of 230,000 as well as camp/summer sites for under 100,000. The Team has been successful marketing and selling in West Greenwich on a regular basis and know the appeal of the town where founder Matt Patty attended high school. For an instant smart home price of your West Greenwich home click the link in blue and we will deliver the goods to your email within 5 minutes. Or check out our search app for your dream home in West Greenwich or to inquire about opportunities for custom construction through accessing the teams vast builder network.